This is to me the ultimate French vegetable cliché, as it is so often on the menu of French restaurants abroad along with coq au vin and escargots. I used to serve it at Restaurant Chez Solange in London where I started as a waitress in the summer of 1975. Because it was served “à la française” from a gratin dish, and not on the side of the plate, I and the other under-fed student servers would fight for any leftovers. There are many ways to do this, and I don’t know which is official. The recipe below works well everytime. I can never make enough. Pick a large head of cauliflower without black spots, remove all the green leaves, rinse and steam whole and upright in a pot or pressure cooker on a collander until just done. Keeping it whole and upright is best as cauliflower breaks easily and the bottom needs a little more cooking than the top. The sauce blanche: In a thick bottom pot, rub a clove of garlic -cut in half vertically and germ removed- then discard, melt 3 walnut-size chunks of butter, 1 tsp olive oil, add 2 tbsp flour and stir with a whisk until smooth on low heat without browning. Add two cups of COLD whole milk, or a mix of milk and light cream slowly while stirring with the whisk. The flour dissolves in the cold milk and the sauce thickens slowly without lumps as it heats. Do not boil. Time to add 1/2 cup of grated Gruyère or Emmental cheese, salt and pepper, a pinch of grated nutmeg (or thyme or oregano). Now, back to the cauliflower. From the bottom, detach the branches in about eight pieces and place them in a Le Creuset gratin dish. Pour the sauce blanche on top and sprinkle with a quarter cup of grated cheese. Bake for 20 minutes in the oven. Important: bring the gratin dish to the table. Tip: If you are serving this at a party, it is best to steam the cauliflower in advance as the odour is not great. The gratin part, however, smells delicious! I don’t know why, but it is a good thing. This entry was posted in Vegetables and tagged calcium, cauliflower, food, gratin, Le Creuset, recipes, sauce blanche, Vegetables, verygoodrecipe. Bookmark the permalink. However, a good oven roasting dish is fine. 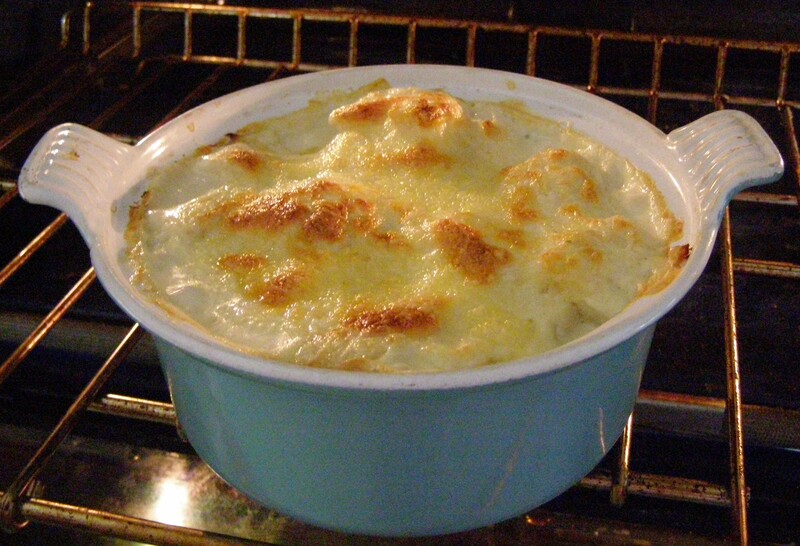 The nice thing about the “au gratin” is that even kids that don’t like vegetables and especially cauliflower, fight for seconds + it has lots of calcium. Thank you Gerry and please come again…. Tonight, let’s say! What is a la cruesat baking dish…I think it may be important to the whole presentation. It certainly looks scumptious.